It's quite likely you've heard by now that not all is well in Ferguson, Missouri. At the end of a long, sprawling saga spurred by the killing of unarmed teen Michael Brown in the summer of 2014, the Department of Justice released a withering report on the Ferguson Police Department's racist policing tactics last week. It also exposed the city's apparent efforts to bleed residents for money through excessive traffic citations and court fees — basically, a nightmare. And the other shoe seems to finally be dropping now: Several Ferguson officials are quickly resigning in the wake of the report. As detailed by The Riverfront Times' Lindsay Toler, four employees in the city of Ferguson have tendered their resignations over the last week, as well as one who was fired outright, and one more resigned today. It's absolutely no surprise to see this happening, all things considered. Early on in this process, the Ferguson Police Department's disastrous handling of the Michael Brown protests alone underscored a lot of people's suspicions of racial double-standards and abuse of police power. So, when no less than the DOJ came knocking at the door, you got a pretty good idea that some folks were going to be out of a job. Here's a rundown of who's walked out the door, who's been shown the door, and who's likely considering it. 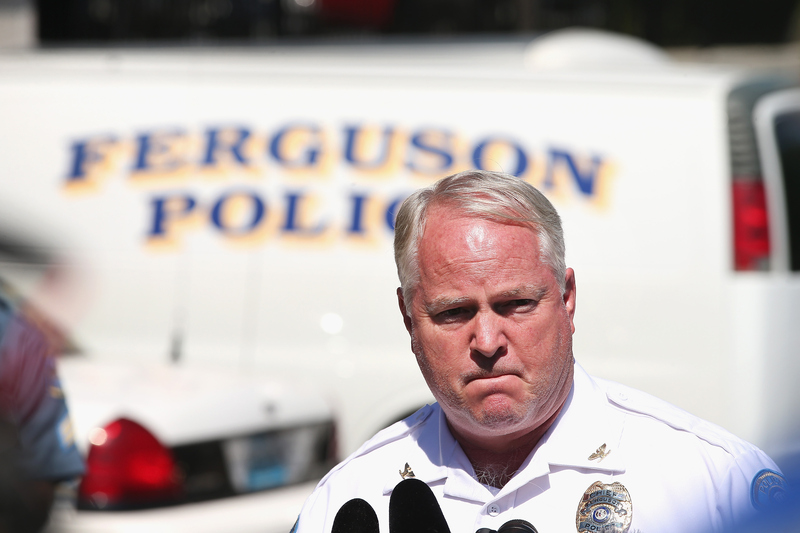 Chief Jackson resigned Wednesday, bringing to an end his inglorious tenure as Ferguson's police chief. The city said it was a "mutual decision," according to NBC News; he was not forced to step down. In responding to the DOJ report when it was released, Jackson remained fairly vague, saying he needed to fully analyze it before commenting. When asked if he would resign, he said he would "take action where necessary." The big headlining resignation so far is undoubtedly that of Ferguson City Manager John Shaw, who was specifically implicated in the city's exorbitant court revenues scheme in the DOJ report. Shaw, in writing to Ferguson Police Chief Tom Jackson, called it "wonderful" to hear of sky-high revenues received through the courts in 2011. As NBC News also notes, Shaw advocated on behalf of a judge who'd been central to the Ferguson court system's bilking ways, making it plain that the influx of cash was a principle concern. He resigned Tuesday night, and released a statement. I feel it is in the community's best interest that I step aside at this time. I care deeply for this community, and I believe that with our coming municipal election it is the appropriate time for the city to experience change in its city manager. Oh, and that judge I just mentioned? He's out too. Ronald Brockmeyer is the man who presided over an aggressive new set of fees and costs in the Ferguson judicial system. For his part, he doesn't believe he should've had to resign — he still insists the report was flawed, and claims he's only resigning due to death threats he's receiving since the DOJ report came out — but he did so anyways, making it official on Monday. His resignation was paired with a dramatic step on the part of the Missouri Supreme Court, reassigning all cases in the Ferguson municipal court system to circuit court. He's also now on an open-ended, unpaid leave of absence from working as a prosecutor in the nearby suburb of Florissant. Sgt. Mudd and Capt. Henke of the Ferguson Police Department also turned in their resignations last week, a result of the DOJ report's unearthing of racist, highly offensive emails sent between members of the force. As the St. Louis American's Chris King detailed, Mudd's transgression is now known — he's reportedly the one who sent the "joke" about a black woman's abortion being paid for by Crimestoppers. Notably, he was also Officer Darren Wilson's supervisor, and turned in crucial grand jury testimony in Wilson's defense. Twitty, on the other hand, was actually fired after the DOJ report went public, also in connection to the racist emails. She's also been accused of abusing her position to "fix" people's traffic citations. If that's true, it'd be a particularly galling abuse of power relative to the fee-happy nature of the city. She was another person who was apparently friendly with Wilson — enough, at least, to smilingly pose with him in the photo above. Will Mayor James Knowles Be Next? Mayor Knowles is quite a different matter than the rest, however — sitting atop a local government that so epically perverted so many things related to race, police violence, the judicial system, and freedom of protest, would it be surprising for Knowles to step down? Not at all. But if enough people central to the scandal besides him step down, like Shaw and Jackson, it's possible he could try to hang on anyways. Remember, this is the same mayor who in August claimed there was "no racial divide" in Ferguson, a claim that looks desperately hollow now. Obviously there's no telling for sure what will happen, but given all the tumult so far, it wouldn't be shocking if Ferguson saw a shakeup at the top.